Brian Hernandez Jr. will be aboard Departing for the 2013 Louisiana Derby on Saturday March 30th. 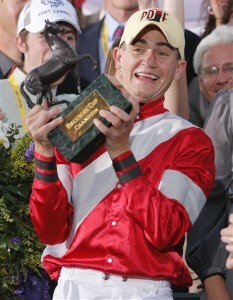 The Louisiana Derby takes place Saturday March 30, 2013 at Fair Grounds Race Course in New Orleans. This is the 100th anniversary of the Louisiana Derby and fans are flocking for the fantastic festivities the Fair Grounds has to offer in addition to the thrilling race card! The $1,000,000 Louisiana Derby is a 1 1/8 mile dirt race for three-year-old thoroughbreds. 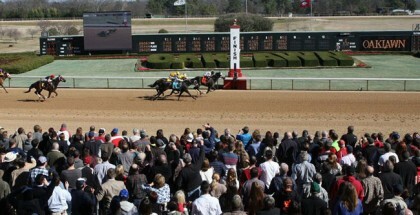 Fourteen contenders are set to compete for 100 points towards their 2013 Kentucky Derby entry. Revolutionary is the favorite with 3/1 odds. He currently holds 10 points on the Kentucky Derby Leaderboard. Code West currently has 20 points on the Leaderboard and breaks from post position number eight with 9/2 odds. Palace Malice has 10 points, Golden Soul has 4 points, and Mylute currently holds 2 points on the Leaderboard. 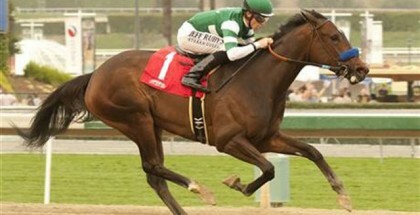 Experts predict Revolutionary will most likely will be the winner of the 2013 Louisiana Derby and I have to agree. I also like Sunbeam, with 12/1 odds, and Departing with 8/1 odds. Sunbean and Departing are not only stable mates. They both will be led to the finish line by jockey bothers Colby Hernandez and Brian Hernandez, Jr. I also plan to put some money down on Code West. He is a powerhouse of a horse but trained by Bob Baffert. I don’t normally pick Baffert trained horses for ridiculous reasons but I think Code West will finish in the top three. Fan favorite Nina’s Dragon is my long shot bet with 30/1 odds. The 2013 Louisiana Derby is the ninth race of the day with a 5:44 PM CST post time. If you aren’t lucky enough to be there, you can view the Louisiana Derby on NBC Sports beginning at 5:00 PM CST. Lady and the Track would like to wish all of the contenders in the Louisiana Derby the best of luck. Good Luck! Safe Run! 6 Sunbean 12/1 Hernandez/Stall, Jr.
7 Departing 8/1 Hernandez, Jr./Stall, Jr.